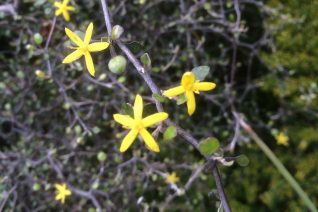 Why, its not a Cotoneaster at all, in fact Corokia is a wildly architectural shrub and evolved its twisted zigzagging stems (the official term is divaricating) and tiny leaves to fend off grazing by giant Moa birds in New Zealand. The birds are now extinct and we are left with this shrub as a natural bonsai. To 5′ tall and 3′ wide in 7 years. Average to enriched soil. Full sun to part shade. Flowers are more profuse in sun. Regular water. Great container plant. The yellow flowers in May are often followed by red berries. Adaptable to part shade and is summer drought tolerant when established. Cold hardy to 5ºF or lower for brief periods. Forms a more of a haze in the landscape than an opaque shrub. Very easy to grow. Looks amazing draped in snow. Long lived.